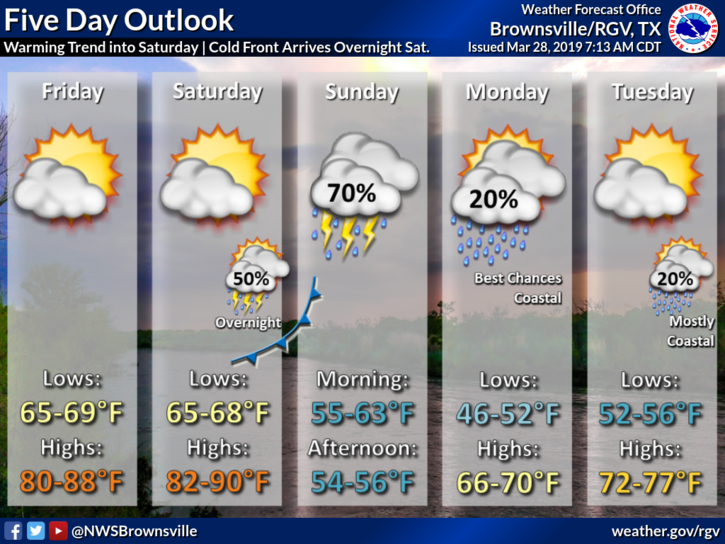 Thursday will be another nice day across the Rio Grande Valley with a moderate breeze, mildly warm temperatures and partly cloudy skies, according to the National Weather Service in Brownsville. Highs will reach the lower to mid 80s across the region, and winds will be blow in from the southeast at 10 to 20 mph. McAllen will reach a high of 84, Brownsville 83 and Rio Grande City 85. South Padre Island will be cooler at 73. On Friday, temperatures will be similar to Thursday’s. On Saturday, some areas of the Valley may hit 90 degrees before a cold front moves in, bringing with it a 50 percent chance of thunderstorms. Expect cooler temperatures on Sunday and early next week. There is a 70 percent chance for thunderstorms on Sunday, when afternoon temperatures will be in the 50s. The best chance for rain will be overnight Saturday and Sunday.